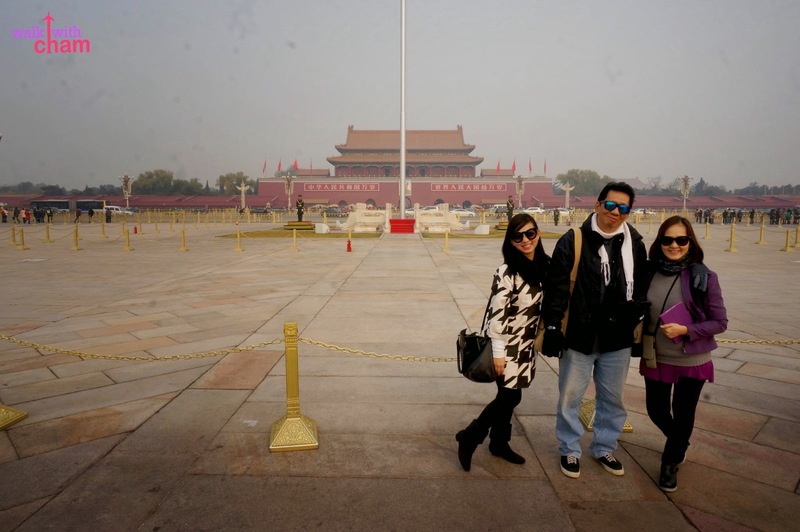 The Tiananmen Square was the very first attraction we visited on our first day in Beijing. 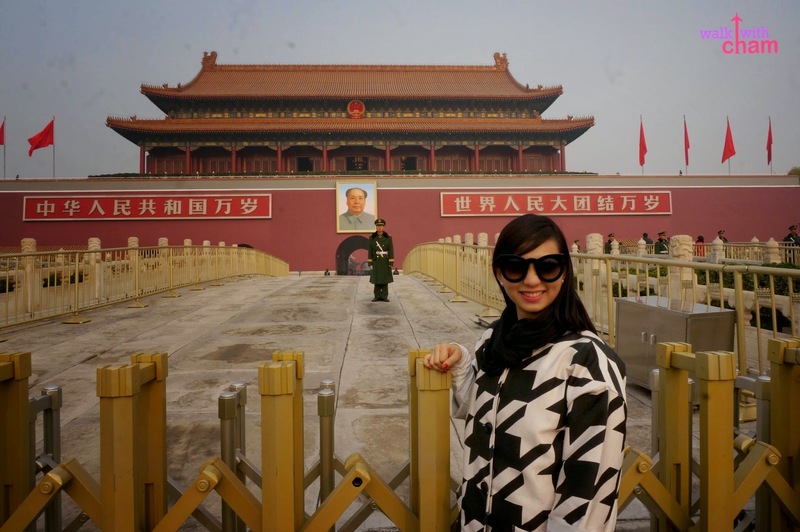 Everyone who goes to the Forbidden City visits the Tiananmen Square first. So that was what we did. 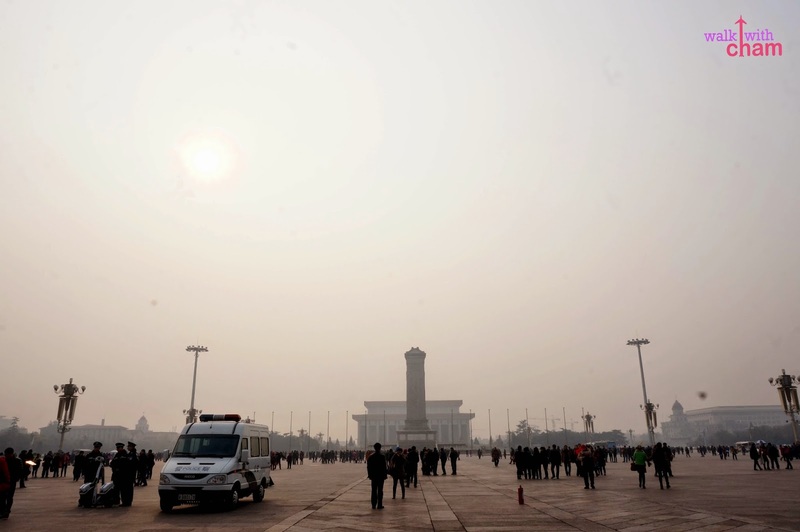 Tiananmen Square is just at the south area of Forbidden City. It is the largest city square in the world with an area of 440,000 square meters where millions of people can fit. 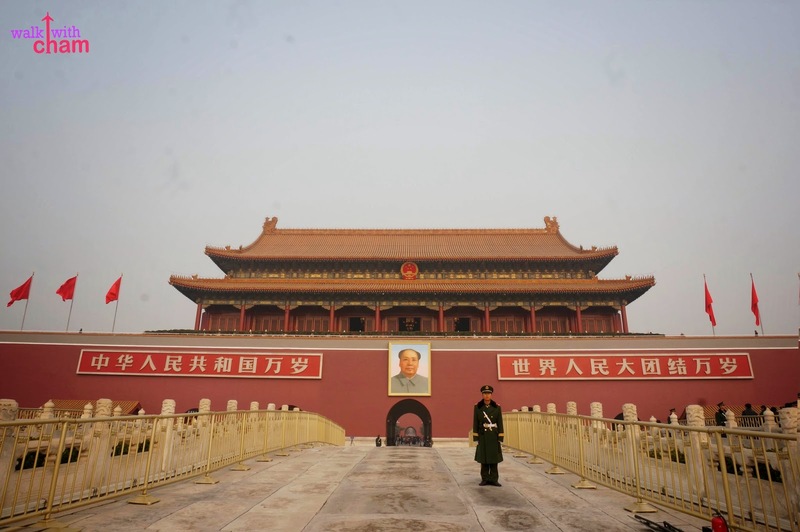 It is famous for Chairman Mao's portrait at the Tiananmen Gate. We took the Subway Line 1 then got off at Tiananmen East Station (you can also opt to exit at Tiananmen West Station) walked our way to a path of trees until we reached a queue of people making their way to the entrance of the Tiananmen Square. Before entering expect a big crowd with high level of security. Police with metal detectors inspected each person and sometimes asked for their passports. Our bags were also checked through x-ray machines. Probably the reason why they have maximum level of security is because the Tiananmen Square had been the area of political events and protests in the past. Two of which were the 1989 Protest where a photo of an unidentified man standing in front of four moving tanks became an icon in fighting against the government. And of course the most famous event was the proclamation of the People's Republic of China by Mao Zedong the year 1949. The place was indeed crowded, kinda reminded me of Luneta in Manila where you can see people strolling and taking photos, vendors were everywhere. Aside from the crowd, vendors and police, the area is surrounded by notable landmarks. At the center of the square stands the Monument of People's Heroes. It is in commemoration of all the martyrs who sacrificed their lives for their fellow countrymen. 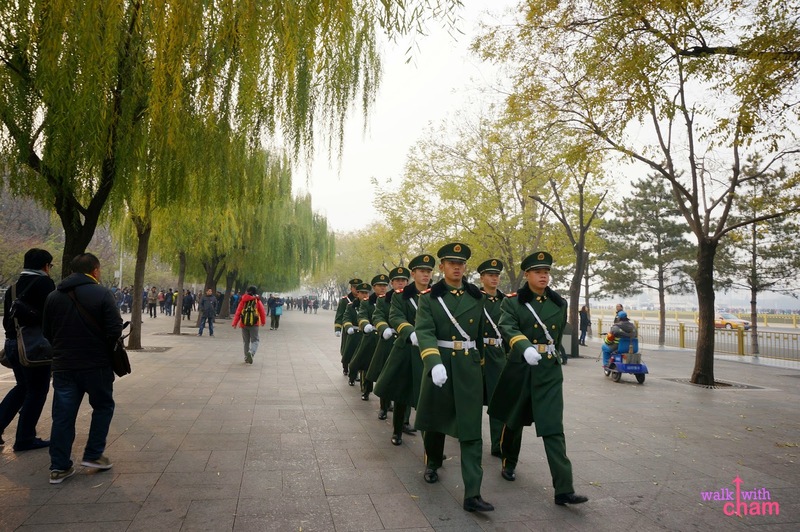 At the south area is where Chairman Mao Memorial Hall is located. Mao Zedong is the first chairman of the People's Republic of China. Here in this hall you can see the remains of the chairman on crystal coffin. No pictures are allowed and I read that the security is twice as high as the entrance plus they will ask you to leave your belongings at the counter so we opted not to check it out. You can see the National Museum of China at the east area of the square. The museum has great collections of artifacts on Chinese art and history. 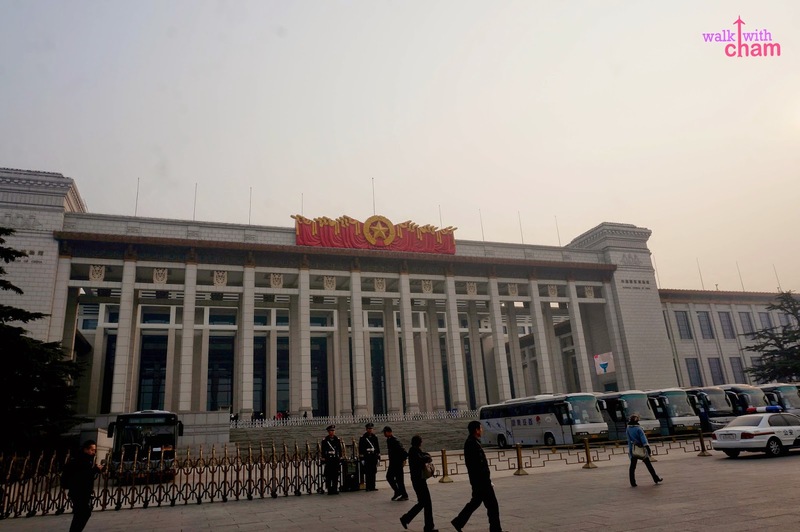 At the west side is the Great Hall of the People where the National People's Congress meetings are held. Tiananmen Tower can be seen at the north area. It has a big portrait photo of Chairman Mao because that was the area where the actual proclamation of the People's Republic of China took place. 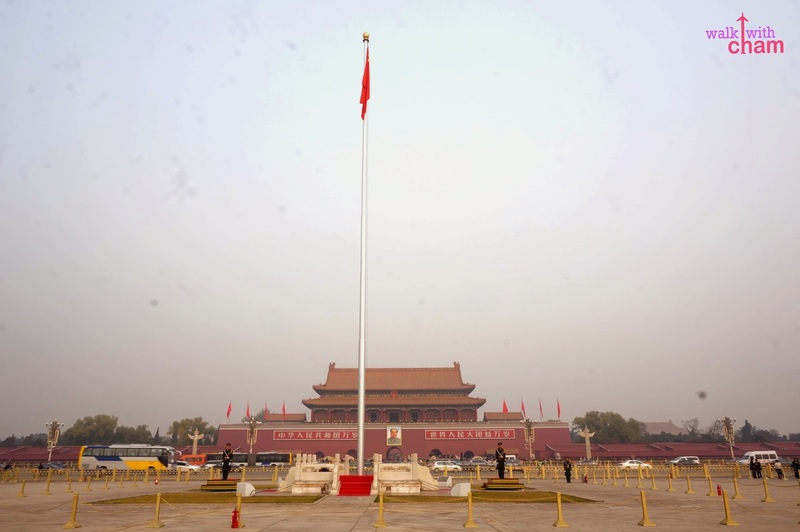 The flag raising ceremony is a must when visiting Beijing, but you have to get up early and should be at the square before sunrise. Getting up really early was not an option for us though. LOL. 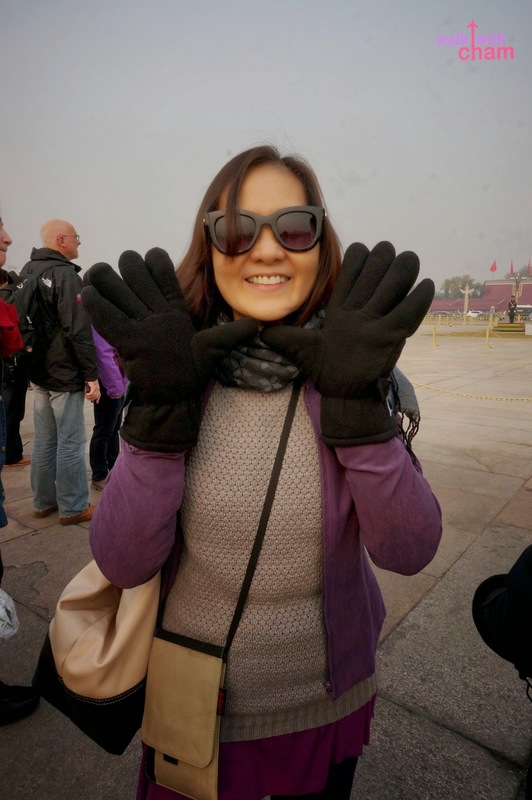 After the quick stroll at the square we then walked up north to have a closer look at the Tiananmen Tower and so we can finally enter the Forbidden City. Seemed to be a hard job standing up for hours. 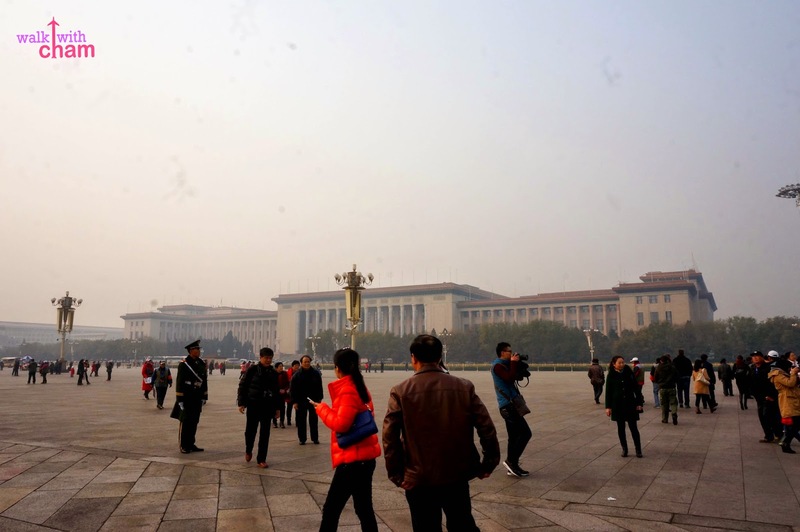 You can explore the Tiananmen Square for around 30 minutes but if you want to roam around the Museum and Chairman Mao Memorial Hall you'll be needing more time to do so.